At the beginning of the summer with the help of a good friend, a former professor, a former boss, and a few current art instructors, Danni Dawson, Kurt Schwarz, and Robert Liberace, I began the application process to be a copyist at the National Gallery of Art (NGA) here in DC. They all kindly provided letters of reference for me, and I am eternally thankful for their effort, as I know this is going to be a great learning experience. 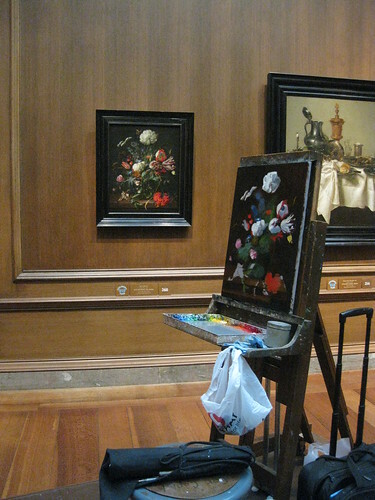 Monday was my first day at it, and I chose the de Heem painting above as my first painting to copy. Here is a photo of where I was at the end of the day. By 4pm I was dog tired and admitting to myself that I had bitten off more than I can chew, especially as I cannot see all the detail of the painting because we are required to stand 4 feet away from the painting… This is by far the most complicated painting I have ever attempted! Danni is always encouraging me to slow down and really observe what I see, so hopefully this painting will teach me to have the patience required to complete a painting with this much detail.